It's time for a new Feed Your Stash Friday Giveaway! The Diaper Junction Heavy Wetter All In One Diaper<./strong> was designed to be easy to use, easy on the wallet, and perfect for your heavy wetter. This one piece diaper has a waterproof outer and a total of 11 layers of absorbent bamboo/organic cotton. The layers are customized with 2 soakers, one snap-in and one sewn in. You will find 2 layers sewn into the body of the diaper and 3 layers in each soaker. Use one soaker for infants, use both soakers for toddlers and/or nap/night time. 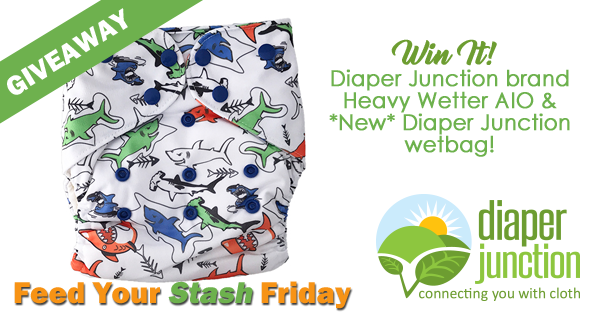 One lucky Diaper Junction fan will win a Diaper Junction Heavy Wetter AIO and Diaper Junction Wetbag of their choice from our in stock selection. I would LOVE midnight garden!!! I would definitely choose the shark print. It is so cute & perfect for the next Shark Week! The shark print is adorable! I the print I would choose is the robotots!! I would choose the shark print! I have been wanting to try this diaper so bad my 6 week old is leaking through everything! I would choose Raven, because little boys are grubby muffins&black matches with everything! I'm all about solids! I'd pick turtle ?? I would pick Raven or Robotots. OMG I love to the moon! simply adorable thanks for a great giveaway! I've been hearing great things about the heavy wetter! And the prints are so fun I'd have a hard time choosing! I love the Andromeda print! But it doesn't look like it's in stock, so I would choose the Turtle color. I love love love Midnight Garden and will have to have it!! I've got shark bait, to the Moon, and turtle and would love a Raven or electric carrot!! I would so love to try one! That shark print is growing on me more each time I see it. I am so excited to try these! I love Robotots and To The Moon! I would choose Shark Bait! If picked I would definitely chose the robots!!! My son really likes them too?? I would pick the Amethyst color. My favorite print is Andromeda but if I won and had to choose a in-stock print my second choice would be Whimsy! I would choose To the Moon. So cute! I would choose To the Moon or Robotots. I would pick spree--super fun! I would choose To The Moon! I'd love to try cobalt! I would love to try the HW in dove! Something about the classic white colour that draws me in! I love the shark print! ??? I would appreciate winning the shark print or Whimsy. Thank you for doing this giveaway. I really wanna try one!! I would probably choose the Raven color or the To the Moon print. Id be happy with any of them! Loving solid colours right now. Cobalt and Raven are gorgeous! If I win, I will likely choose Shark Bait! Shar bait ?? I have been eyeing that diaper ! I'd choose Robotots or Dotty. I'd choose amethyst. so pretty! The prints I like a kind of girly, so I'd probably pick a solid: cobalt or parrot. I would choose midnight garden or Dotty! I absolutely love my DJ heavy wetter! If I won I would choose andromeda! Is it posie? The one with swirls & flowers. I've wanted that so long but always used the dr 3.1. And it was just solids. I am entering this giveaway. Fingers crossed!! I have a heavy wetter baby boy who sleeps through the night and is currently using disposables at night but I'd like to find a good night time cloth solution!! I would love Turtle!! ?? I loveee the midnight garden, its adorbsss! !